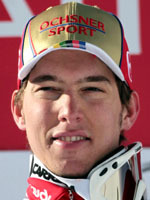 Alpine skiing is Switzerland's national sport and its crown prince Carlo Janka shot to superstardom there by winning the 2009 world championships giant slalom at Val d'Isere and taking bronze in the downhill at just 22-years-old. He is calm, brave, multi-talented and on his day could take a podium spot in any Alpine discipline other than the slalom, so Swiss fans are rubbing their hands with glee as Vancouver swings into view. It may have been Friday the 13th as the giant slalom got underway but Janka negotiated the 53 gates down the Bellevarde course in 1min 08.25sec, 0.48sec ahead of Austrian Benjamin Raich, then leader of the giant slalom standings and reigning Olympic champion in the discipline. On the second leg he overcame an early mistake regaining his composure over the bottom two-thirds of the piste to finish 0.71sec ahead of Raich and 0.99sec ahead of American Ted Ligety. The victory came less than a week after his bronze in the downhill, making his first world championships a real breakthrough tournament. Janka later said he loved the very steep slope, adding he had been boosted by news his friend and teammate Daniel Albrecht had been revived from a coma brought on by a training accident three weeks previously at Kitzbuhel. Janka's first full season was 2007-2008 and his coaches had been expecting huge things from their protege. They watched with quiet satisfaction as the debutant came 8th at the super-combined at Val-d'Isère a year ahead of the worlds and 9th in the giant at Whistler Mountain, where the 2010 Olympic action will take place. He is technically gifted, mentally strong and physically very athletic. "He's madly talented and gets to know the slopes in no time at all. He's got nerves of steel, nothing bothers him," says Patrice Morisod, one of the national Swiss coaches. "I'm a calm person, I never get angry, that's why the nickname 'Iceman' suits me so well," says the skier himself. "I'm a giant slalom man who wants to do better at downhill and super-G," he explains. With talent, ambition, strength and calm, Janka has a recipe for success likely to propel him to the highest peaks of triumph at Vancouver.